* Served with Vermicelli Rice noodles, bean sprouts, fresh herbs, cucumber, carrot, romaine lettuce, crushed peanuts, and house fish sauce. Made with beef broth and pho spice served with rice noodle rare lean beef, well done flank, Slice meatball, bean sprouts, basil, Cilantro, limes, white onion and jalapeno . Rice noodle, chicken broth, white meat chicken, chive, cabbage, romain lettuce, onion, fried shallots, black pepper, carrots, broccoli & bean sprout. Jasmine rice cooked in chicken broth. Topped with chicken, cilantro, onion, fried shallots and black pepper. Serves with pickled carrots & daikon and ginger & scallion paste. Chunks of beef brisket marinated with five spice and stewed with ginger, lemongrass , onion, Orange peel, tomatoes and carrots until tender and fragrant. 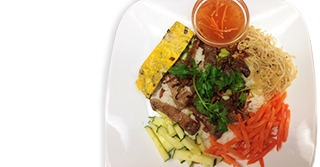 Served with your choice of rice noodle or Banh mi. Chicken broth, rice noodle, fish ball, shrimp, chicken, fish tofu, lettuce, onion, chive, romain lettuce, bean sprout, fried shallot, cilantro, black pepper. Bun (rice vermicelli noodle) is ladled over with Coconut curry broth infused with ginger, lemongrass, cinnamon,onion and chilies. The soup is then dressed with tender chicken, broccoli, carrots and cilantro garnish.